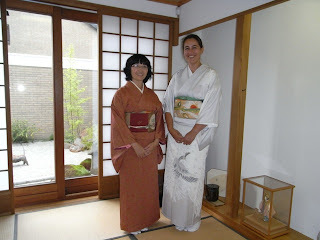 And since the summer holidays are coming up, I doubt if I can wear kimono this month. But I'll try and do my best! So, on to the Kimono Challenge! How did you discover and get into kimono? Your most used kimono item(s) (not counting jubans, datejimes etc.). Your least used kimono item(s). Your favourite coordination(s) so far. What do you like and don’t like about kimono. Your dream kitsuke items (or at least items you really really want but can’t get for whatever reason). The evolution of your kitsuke. I don't know if accessoires also count, so I'll share a few items. What I need most now, and I'm thinking about making them myself, are obiages! At the moment I've got 4 shibori obiage: standard red and black and 2 kinds of pink, and 4 'normal' silk obiage: black, pink, purple and green. Of my accessoires the green obiage is the most used item. Another accessoire I have more of are zori/geta. Well more.... 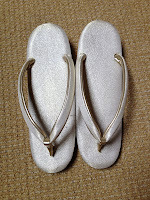 I've got 1 pair of geta and 2 pairs of zori, and the pair I use most are my golden zori. A former colleague of my boyfriend came from Japan and asked if I needed anything for kitsuke. So I asked for zori in my size (they are 25 of 27 cm). He did some searching and found me my golden zori. They're a perfect fit, and that's why I wear them a lot. And gold matches almost everything ^_^. As for kimono and obi being most used, I don't really have one. If I have to guess, I think my most used kimono and obi are those who make my Peacock outfit. Just because they are such a perfect combination I've worn them a couple of times (to an exhibition with Rota and Misuchi, a private tea ceremony, at home and I've dressed my sister in them). Ik vind die obi die je bij die (chidori!) yukata aan hebt errrug mooi! Had je die yukata bij een engelse site gekocht toevallig? Hij komt me zo bekend voor! Haha, Rota, Ja ik weet dat deze je favoriet is. Mocht ik 'm ooit weg doen (of er komt een leuke gelegenheid) dan weet deze de weg naar je huis wel te vinden! Amy, deze heb ik van Hong gekocht. Ze had deze oa op FB geplaatst toen ze een sale hield. Je ziet er stralend uit in die witte kimono. We hebben je gemist op de laatste KDJ ! I know, de Japanmarkt leek me ook erg leuk, maar helaas had ik andere plannen in de agenda.